Migration Trauma, Culture, and Finding the Psychological Home Within explores the profound psychological effect of migration through an in-depth study of Eastern European migration to the United States. In presenting the clinical case studies of Eastern European migrants seeking long term psychoanalytic treatment, Grace P. Conroy offers a thorough investigation into the seldom addressed relationships between migration, internal culture, and identity. 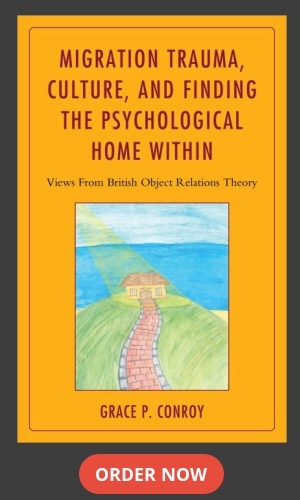 Drawing from British Object Relations Theory, Conroy examines pre-migration history, inner culture, and in particular early psychological development to discover both the factors that lead to successful psychological migration as well as those factors that lead to failure. A valuable resource for practitioners who work with immigrants, this thoughtful and engaging volume provides insights into the psyche of migrants in the process of integrating into new cultures, and ultimately explores the details and nuances of inner psychological struggles and transformations of the migratory process. Dr. Grace P. Conroy is an experienced psychotherapist, psychoanalyst, published author and a contributor to knowledge regarding cross-culture, identity, and the “migration phenomenon”. She has been in private practice in New York City for over twenty years working with adolescents, adults and elderly clients. Her specialties include a wide variety of disorders such as depression, obsessions, anxiety, identity issues, addictive behaviors, and many other issues. In her publications she explores what is one’s “emotional home”, what enables one to find a “psychological home within” and, how one develops the inner capacity to accept and understand all kinds of feelings; so one can live a meaningful life. She further examines the process of getting in touch with different aspects of oneself in order to enable one to live an everyday creative existence (with small “c” creativity). Her particular interest is in “migration trauma”, cross-cultural work, early self development, and identity issues. She has been engaged in working with the multicultural population, teaching, and supervision. Her newly published book, entitled “Migration Trauma, Culture, and Finding the Psychic Home Within” is a unique work based on her twenty years of experience working with clients from different parts of the world and dealing in various ways with the issue of finding a comfortable psychological place within a new culture, as well as coping with often unknown yet present underlying feelings of grief, fears of not belonging, depression, and identity confusion due to “migration trauma”. This book is essential reading for any educated lay person who has experienced migration/ relocation or anyone interested in a deeper psychological understanding of the migratory process. This is the only psychoanalytic book written about Eastern European migration to America and dealing with the traumatic and creative aspects of the migration process, and its effects on people’s lives in ways often not seen or recognized.